Invite your friends and family or recruit your co-workers to serve as bell ringers! 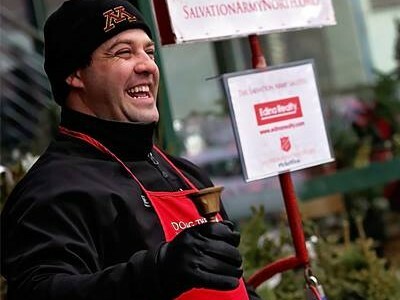 As Bell Ringers, volunteers help bring in the joy of the holiday season to millions across the world. For many people, seeing the red kettles and ringers signal that Christmas is here. The money you raise brings hope to thousands of less fortunate families, children, seniors and individuals by giving them access to almost 80 programs such as After School Care, Rent and Utility Assistance and Feeding Programs - right here in the Greater Garland Area! Adopting a Red Kettle for a full day also provides maximum public exposure of your business, church or civic group's commitment to the community! Wear your group's apparel and get up to 10 hours of advertising at a high traffic location. This a great opportunity for all ages! THANK YOU FOR DOING THE MOST GOOD!